Commuters in Seattle will be facing their own version of LA’s 2011 “Carmageddon” freeway shutdown. 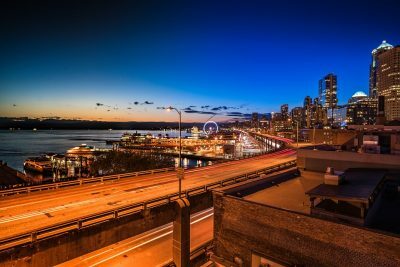 The Alaskan Way Viaduct, a major road for commuters along Seattle’s downtown waterfront, will shut down for good on Friday. Officials say this shutdown will usher in a painful traffic period in the history of Seattle. Seattle will tear down the aging, double-decker, 2.2-mile highway. The viaduct carries about 90,000 vehicles per day. Seattle will replace it with a four-lane tunnel. Officials say the viaduct was damaged in a 2001 earthquake. Replacing it allows Seattle to build new parks, paths, and other amenities along the waterfront. However, the new tunnel will not open until approximately three weeks after the viaduct closes. This is because workers need to realign the highway into the tunnel. And there are various other construction projects that will constrain traffic in the city. Washington’s transportation agency put a clock on its website that counts down to the viaduct closure. The agency says that this will be the longest major highway closure the area has ever seen. During the squeeze, school bus drivers will star work earlier. Officials advise commuters who can work from home to do so. If they can adjust their work hours, that is also a solution. Officials recommend that anyone who can walk, bike, join a carpool, or use public transit should take advantage of those other means to get to work. All these precautions serve to avoid having so many cars going into downtown during peak commute hours. What about you? Will the great “Seattle Squeeze” affect your morning commute? Do you think the next few weeks will be a nightmare?